Visitation for John James Cameron (Chmielewski) of Wauconda, formerly of Lake Zurich, will be held on Monday, November 5, 2018, from 9:00 until the time of the Memorial Mass, 10:00 am at St. Francis de Sales Church, 33 S. Buesching Road, Lake Zurich. The Interment will be private. John, an avid fisherman and baker as well as Master Gardener, passed away peacefully at the age of 85, on Wednesday, Oct 31st surrounded by his family. He is preceded in death by his high school sweetheart Ruth, married 55 years, and his son Robert. John was born on March 5, 1933 in Milwaukee, WI, where he later attended Marquette University, and was awarded a Bachelors degree in Journalism in 1957. Upon graduating, he served as Public Relations Director for Marquette, and received a National Award for a program that honored the crew of Apollo II. This began his long and distinguished career in Public Relations. Companies he served included Metropolitan Milwaukee Association of Commerce, Miller Brewing Co., Kraft Foods, and eventually he retired from Ace Hardware Corporation in Oak Brook, IL as Director of Corporate Relations after 18 years. 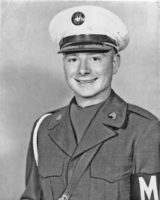 John was a Korean War Veteran, serving in the Military Police in the Army. In 2016, he was honored in Washington DC as a member of the Honor Flight. John was an active member of the Ela Senior Center as well as the Lake Zurich Garden Club. He is survived by his 2 children, son John Jr. (Karen); daughter Annemarie (Steve Coffman); sister Elizabeth (James ); 4 grandchildren John, Maxwell, Cole, Savannah. Also preceded were seven brothers, Alex, Paul, Joseph, Walter, Francis, Edward, and George, and sisters, Harriett and Martha.